updated 7.9.18: You can now get fresh veggies Mondays, Wednesdays and Thursdays. The latest addition is The Trustees' mobile farmers market in the Seaport Thursdays from 2:30 pm - 6:30 pm at 85 Northern Avenue. The mobile market features meat, milk, cheese, eggs, and other local goodies from other Massachusetts farms. 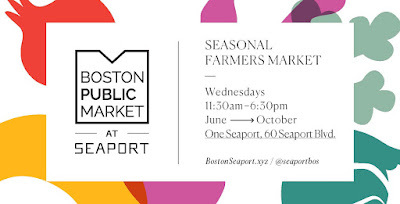 The Boston Public Market Association is in the Seaport for this summer’s farmers market at One Seaport every Wednesday, 11:30 am - 6:30 pm, June through October. Find fresh, seasonal food from local Massachusetts and New England vendors offering produce, meat, seafood, bread, prepared food, and more for food on the go and your dining table. The South Boston Farmer’s Market kicks off its season on Monday, June 11th at 12 pm. Get early spring vegetables and potted flowers, from returning Massachusetts based Freitas’ & Wenger’s Farms. Try local and fresh meat, like grass-fed beef and naturally raised pork from Shamrock Hives Farm this season. Wenger’s will also carry their famous baked goods. Enjoy live music with Jan and Lou Borelli from 12 pm - 3:00 pm and the SBNDC will give away $2 coupons to its market shoppers, valid for fresh and healthy market products (as long as supplies last). Come to the market manager’s tent to get the coupon, including our market loyalty card! The South Boston Farmer's Market runs through October 30, and is held every Monday from 12 pm - 6 pm at 446 Broadway, on the sidewalk in front of the municipal parking lot.